Saint Dymphna was born in the 7th century. Her father, a petty king of Oriel, was still a pagan whilst her mother, a descendant of a noble family, was a devout Christian, remarkable for both her piety and her great beauty. Dymphna was beautiful like her mother, and a winning child. Every affection and attention was lavished upon her from birth and young Dymphna was placed under the care of a pious Christian woman, who prepared her for baptism. This was conferred by the priest, Father Gerebran, who seems to have been a member of the household, and later taught Dymphna writing and religion. She was a bright and eager pupil who advanced rapidly and, when still very young, Dymphna, consecrated her life to Jesus in a vow of chastity. An unexpected cloud overshadowed the happy childhood of this beautiful girl. Her mother died when she was fourteen. Dymphna's father, Damon, greatly mourned his deceased wife and for a long time continued, helpless with grief and mental illness. At length he was persuaded to seek a second marriage. He sent messengers throughout his town and other lands to find a woman of noble birth, resembling his wife, who would be willing to marry him. When none could be found, his evil advisers told him to marry his own daughter. Dymphna fled from her castle together with St. Gerebran, her confessor and two other friends. Damon found them in Belgium. He gave orders that the priest's head be cut off. Then Damon tried to persuade his daughter to return to Ireland with him. When she refused, he drew his sword and struck off her head. She was then only fifteen years of age. Dymphna received the crown of martyrdom in defense of her purity about the year 620. She is the patron of those suffering from nervous and mental afflictions. 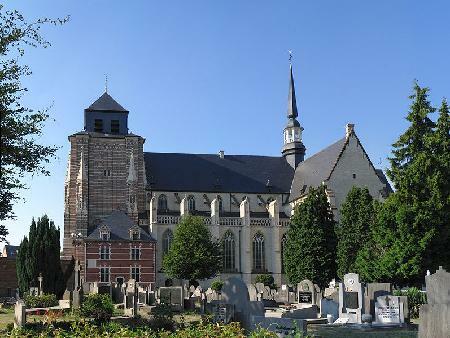 Many miracles have taken place at her shrine, built on the spot where she was buried in Gheel, Belgium. St Dymphna's Church in Gheel.